Almost a decade has passed since the first demonstration of thermally activated delayed fluorescence (TADF) in an OLED at Kyushu University in 2009, and these past ten years have seen rapid and remarkable advances in this scientific field. To mark the 10-year anniversary of TADF, we are delighted to announce the organization of the 4th International TADF Workshop in Fukuoka, in collaboration with Opera and i3-Opera, to share the latest advances and future direction of TADF science and technologies. The workshop will cover a diverse range of topics in the areas of TADF and excitonic materials, physics, and devices. 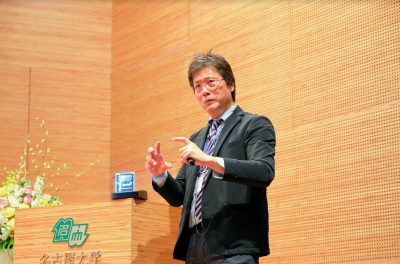 On March 6th, Kyulux’s CEO Junji Adachi gave a talk at the OLED Korea 2019 conference, in Seoul. Junji discussed Kyulux’s latest Hyperfluorescence™ performance, especially new TADF Device for 470 nm blue Hyperfluorescence™ that achieves 200 hours of lifetime (LT95 at 1000 nits) and an EQE of 22% (at 1000 nits). Junji also demonstrated a Hyperfluorescence™ OLED prototype panel and Wisechip’s yellow PMOLED panel. Kyulux is looking to hire a new data scientist to join our Boston team. A job opening exists for a new talented scientist for our data engineering team to help discover new OLED materials alongside colleagues in the lab. The role involves the use of advanced statistical and data science concepts and the creation of machine learning models. More information here. The location of this new role is in Boston, MA, USA. E-mail us here if you are interested! 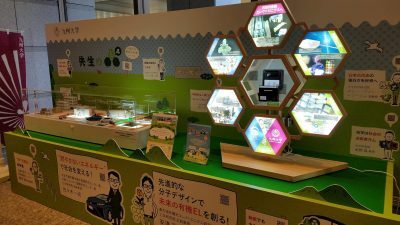 On February 15th, Kyushu University opened a PR event that will be running until March 25th, introducing its new “Ito Campus” that was completed in September 2018. The PR event is being held at the Ministry of Education, Culture, Sports, Science and Technology (MEXT), 2nd Floor Entrance, Tokyo. 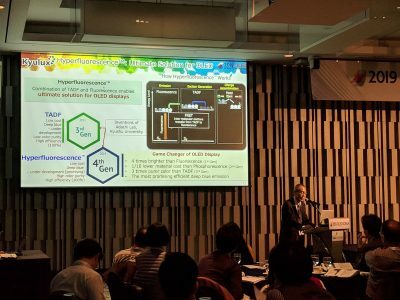 In this event, Kyulux displays the prototype panel intended for mass production as the world’s first using Hyperfluorescence™, jointly developed with WiseChip Semiconductor Inc. in Taiwan. 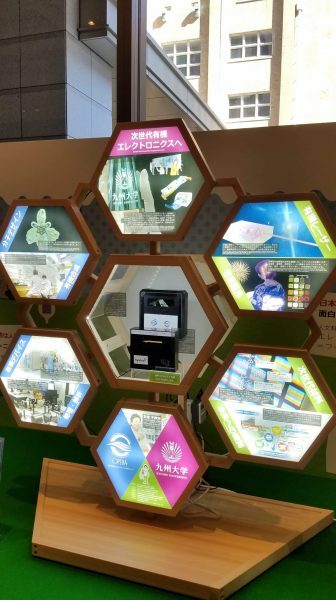 The display will be taking place at the exhibition booth called “The World of OPERA” (Kyushu University Advanced Leading Organic Optoelectronics Research Center). The exhibition is taking place from 10 AM to 6 PM, Monday through Friday (Entrance Free). The last entrance is limited to 30 min before the hall closes. On Thursday, February 28th, 2019, Nagoya University held the 24th Nagoya Medal of Organic Chemistry – prestigious awards that are given to selected chemists for their achievements. The gold medal is awarded to a synthetic chemist with international research achievements and the silver Medal is for a synthetic chemistry who accomplished excellent research in his field, a domestic rising star expected to have a bright future. Winners of these Nagoya Medals have been known to reach impressive achievements in their work. Kyulux is proud to announce that its very own Prof. Chihaya Adachi (Kyulux’s Co-Founder, Scientific Advisor and Ex Officio Board) was chosen as The Silver Medalist of “The 24th Nagoya Medal of Organic Chemistry this year.